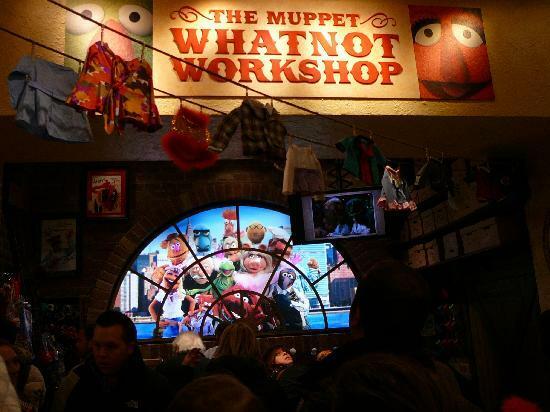 The Muppet What-Not Workshop is now under construction and is being built in the Stage 1 Company Store located by Muppet Vision 3-D. Soon you will be able to build your own Muppet in Walt Disney World. You'll pick your body, eyes, nose, hair and clothes. Here is a picture of the current construction that is going on. Has there been any update about when the Whatnot Workshop is going to be open at Hollywood Studios? I am very much hoping it will be soon! I haven't seen anything else on these. As of September 2010 there is no construction going on. I'm looking into seeing if they have canceled the building of the Workshop. The store has been refurbished but with no signs of the Whatnot Workshop.